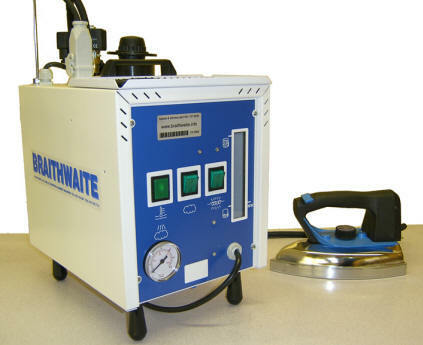 The Braithwaite GL Pro is a 5 litre industrial steam generator made for: design rooms, tailors workshops, professional ironing services, alteration shops, pressing rooms & clothing manufactures etc. Manufactured in Europe, with quality in-mind, using only industrial grade components for prolonged use and a long service life. For greater durability the internal steam pressure chamber is made from stainless steel, with a brass reinforced heating element fitted directly inside the chamber. Its classic & robust design has changed little over the past 20 years; with its appearance inspiring many "Look-a-likes". It requires no special installation, its very easy to operate, uses standard tap water & is powered by a standard 13 amp plug. 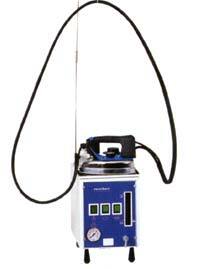 5 litre table top mounted industrial single iron steam generator & industrial steam Iron. Same as the GL-Pro but with added work stand & casters. Industrial components used throughout our entire range. Top mounted, pressure locking, manual filler cap: for adding standard tap water.